Adobe InDesign is a digital publisher that makes light work of creating professional publications. From glossy magazines to impressive brochures or even whole books, you can use InDesign for basically any publication you might need to create. The designs you can create are limitless, you just need to update your skillset to match its capabilities! Luckily, we've rounded up the best InDesign tutorials on the web, which walk you through a variety of design projects. You're sure to find something here to stretch your skills. You can jump directly to a section using the dropdown menu above, or browse them all. For more Adobe action, check out our rundown of the best Photoshop tutorials, or sharpen your skills with our selection of the finest Illustrator tutorials. Get Adobe Creative Cloud now. This is the first of a mammoth 70 part tutorial series from Tutorials TV that will teach you absolutely everything you need to know about using the latest update of InDesign CC 2019. If you head over to YouTube then the menu on the right of the video will let you skip to the parts you want. The first video, shown here, gets you started with the interface of the new update. It's quite a dry watch but full of great basic information to get you going. If you're a newcomer to InDesign, spend a couple of minutes watching this short tutorial that explains exactly what the software is, its purpose and who uses it. It's a really clear explanation that shows off many of the time-saving tools and features of InDesign CC that you'll probably end up using all the time. This series of short tutorials, created by Adobe, is designed to teach you everything you need to know to start working in InDesign. There's a mini video showing you how to make and save a document and a tour of the InDesign workspace. As you continue through, you'll learn how to add and format text, then move on to working with graphics. 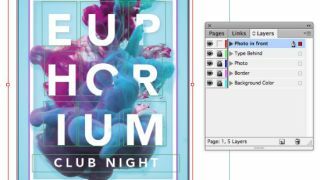 There are many tools to get your head around in InDesign and it's easy to feel intimidated by them all. In this five-minute tutorial, Matthew Pizzi introduces you to the primary tools in InDesign CC and explains what does what, so you won't feel quite so lost. The basic idea behind master pages is that whatever you place on the master page will all be applied to any other pages that have the master applied to them. They are extremely useful for ensuring consistency within your designs, and once you've got the hang of them they're ideal for streamlining your workflow. Here a basic guide to how to use them. This tutorial will walk you through the basics of working with graphics using InDesign. The four step guide will teach you to add graphics to projects; move, resize and fit graphics; learn about linked graphics and to wrap text around objects. In this tutorial, Adobe evangelist Terry White picks out five key tips for working with images in Indesign CC. It's a recording of a live session, so there's a bit of faffing about at the start – you can skip the first couple of minutes if you want to get straight to the tips. This seven minute tutorial gives you a basic lesson in using Typography in InDesign. Ben G Kaiser runs through five basic tips to create interesting layouts and compositions when using type. It's clear and concise, so if you want more detail Kaiser also has a full InDesign tutorial series on his channel. In this video tutorial, Terry White is back, alongside British graphic designer Dave Clayton. The two of them share cool InDesign-made projects they've discovered, as well as tricks and tips they've picked up from Adobe events and their own experience using the design tool.